Designing and installing a system suspended very high above the ground and that could cope with the high level of natural ambient light in one of Cape Town’s premier shopping centers was a challenge, but one that Martin and Litec could meet. It is said that good things come to those who wait, which was certainly true for Martin’s South African distributor, Electrosonic, who was contacted more than a year ago by Marcel Zandberg of Slave Distributors in Cape Town regarding a top secret project. At the time, all Marcel could tell Electrosonic’s Entertainment Lighting Manager, Bruce Schwartz, was that they needed the brightest lights that Electrosonic could offer. That was the start of what became a challenging project at the Tyger Valley shopping center in Cape Town. Situated in Bellville, the Tyger Valley Shopping Center comprises a massive retail area spread over three levels, offering everything from retail stores to restaurants. The center also provides entertainment for the whole family, with regular events for children, a variety of exhibitions, product launches, celebrity performances, competitions and annual festive season activities. The original lighting in the center’s Arena was supplied by Electrosonic more than 12 years ago, and when the food court and entertainment area was to be reconstructed with a much higher roof, Electrosonic was asked to quote on the new lighting system. The brief was for a system that could be flown very high above the ground and that could cope with the high level of natural ambient light. It also had to be flexible enough for parts of the system to be utilized for smaller functions. This proved to be quite a challenge given the multi-level nature of the Arena. Additional challenges in the brief were that as little as possible of the infrastructure was to be visible, and there was to be no access to the roof via the cat-walks. 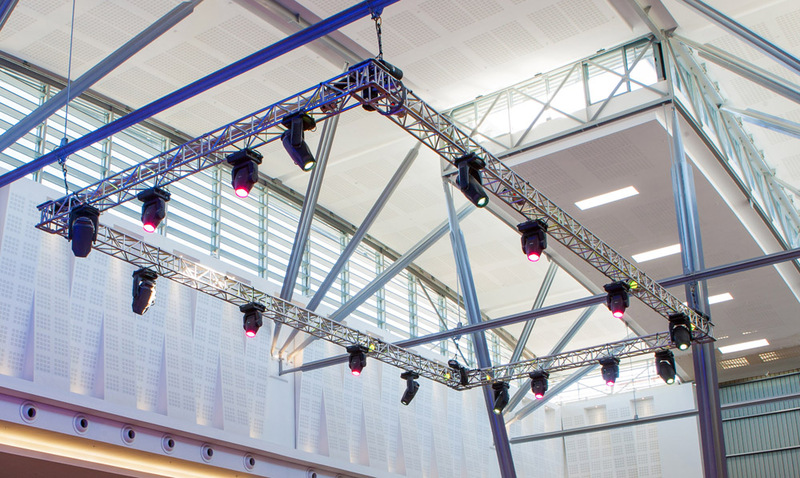 The design incorporated a general lighting setup for the lower levels, a main truss rig approximately 20 meters from the ground, and two trusses left and right of a large LED screen. All this was to be controlled via a control desk that could be plugged into a CAT 5 network. A DMX distribution system was needed for the various areas and a media server was to be installed. To overcome height and daylight issues, Martin MAC IIIs and Martin MAC 2000 XBs were chosen as the workhorses. These 1500-watt units were the first to be sold in South Africa and proved to be a fantastic choice. There are very few large format moving light profiles and washes on the market and the tried and tested MACs are ideally suited to this type of application. MAC 700 Washes and MAC 700 Profiles are also used in order to provide some backlight as well as to illuminate the mesh behind the LED screen. The brief called for the ability to control the lighting and video system from 7 plug-in points. The best way to do this was to use CAT 5 and to create an Artnet network. The Martin Ether2DMX8 was placed in the rack room 70 meters away and 7 x CAT 5 lines were run back via an Ethernet Hub to the Ether2DMX8 box. The box converts the Artnet from the desk (with an assigned IP address) to DMX 512 signal and 8 x buffered DMX outs are sent via Martin DMX 3.5 Opto Splitters to the main truss, media server, LED Cans, dimmers and screen trusses. A DMX Switch pack was installed in the main distribution board to turn on the intelligent lights remotely. A requirement of the brief was for the system to be operated day to day without the need to plug in the control desk, which was to be used only for larger events. The solution was to install a Maxxyz PC system connected via IP to the Ether2DMX8 box. The box switches over to the desk when it is plugged in, or falls back on the Maxxyz PC for day to day running with cues set up to cater for a variety of functions and events. The M1 from Martin was the obvious choice for Marcel when it came to selecting a powerful control desk that was also compact, simple, and easy to use. Not only does it have a clear layout and plenty of playback hardware, but it also integrates seamlessly with all the other Martin gear, with very little configuration required. Bearing in mind that a large LED screen was to be installed, Marcel specified a DMX controlled Martin Maxedia Compact media server as the gap between entertainment lighting and video is diminishing rapidly. The media server enables custom footage, such as company logos or promotional material, to be manipulated in a variety of ways for screening, and the content can be altered as required. For example, the screening of promotional graphics on a normal shopping day can be switched to a live rugby broadcast on a Saturday afternoon. Marcel was impressed that with the push of a button on the desk, the lighting cues would recall the video content - seamless integration. Given the time constraints and the customary difficulties involved with working in tandem with electricians and other subcontractors, Slave Distributors was applauded for being one of the few subcontractors who managed to complete their installation before the practical completion deadline date.